Parent Academy offers FREE workshops for parents on various topics throughout the year. 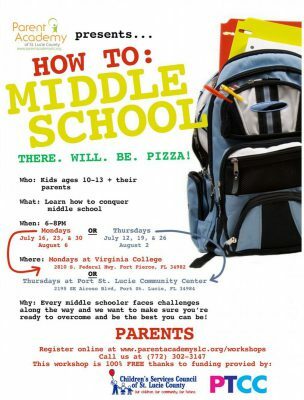 Two workshops coming up are Parenting Wisely and How To Middle School. These valuable workshops are offered in July in August at convenient locations in St. Lucie County. Parents, community members, and students,Are you in search of quality resources and activities to support academic studies this summer? Look no further! Don’t let the summer “slide” away when you have resources for Reading/Language Arts, Mathematics, Science, Social Studies, Arts and Technology, College and Career, and ELL at your fingertips.